A gorgeous tree of life tapestry in brown and rose based on the designs by William Morris. The tree of life is a beautiful symbol rich in meaning and inspiration. Here we see the immortal tree of life in a design by William Morris, and in tones of a brown background and an abundance of rose colors in its flowers. This particular version of the tree of life tapestry is exceptional in its use of a gorgeous color palette of rose and browns. These colors blend in beautifully with the variegated greens in the foliage of the tree. The reds and browns of the birds provide a highlight in color to the piece, as does the crimsons in the flowers of the border. The tree of life is a symbol in many cultures and represent the life giving force of nature. The tree roots reach into the earth to represent its connection with the earth, and its branches reach towards the sky to represent its connection with the heavens. In between, the lush branches represent life on earth, with is full of richness and color, providing a gorgeous view for the viewer, as well as shelter and home for the birds. 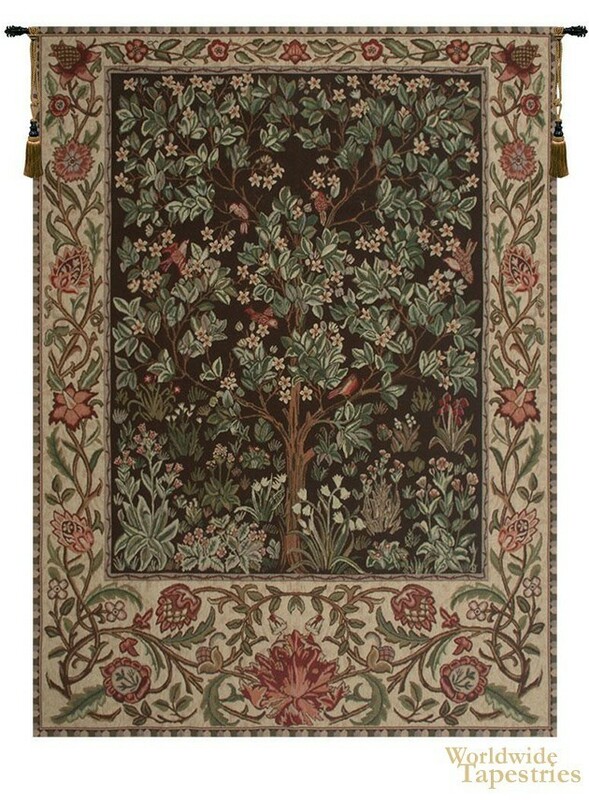 This tapestry "Tree of Life - Brown And Rose" is backed with lining and tunnel for easy hanging. Note: tapestry rod and tassels, where pictured, are purchased separately. Dimensions: W 60" x H 92"